Lithuania said Friday it has rejected a request from Prime Minister Benjamin Netanyahu to move the remains of the Vilna Gaon from Vilnius to Israel for reburial. The issue was raised during talks between Netanyahu and his Lithuanian counterpart Saulius Skvernelis in Jerusalem on Tuesday, Skvernelis’ national security advisor Arnoldas Pikzirnis told AFP. “We received a kind request to consider whether the remains of the Vilna Gaon could be relocated to Israel,” Pikzirnis said. 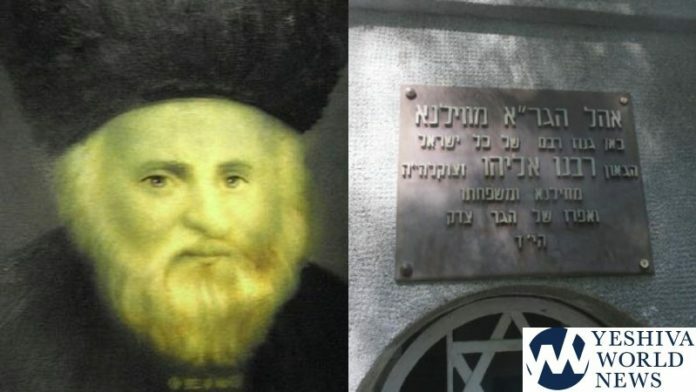 Kukliansky said the legacy of rabbi and scholar Elijah ben Shlomo Zalman, known as Vilna Gaon, was a crucial part of the history of Lithuania’s once thriving Jewish community. Netanyahu first privately raised the idea when he visited Vilnius in August, a government source and a Jewish community source who met him during the trip told AFP. A spokesman for Netanyahu in Jerusalem did not immediately comment. Amir Maimon, Israel’s ambassador to Vilnius, also declined to comment but did not explicitly deny that Netanyahu made the request. He was Niftar in 1797 at the age of 77, and was buried in the Snipiskes cemetery in Vilnius. His remains were moved to a new cemetery on the capital’s outskirts in the 1950s. Any opinions from the gedolei Torah on this? Or is this solely the brainchild of Rabbeinu HaRav HaGaon Baby Netanyahu? The people who moved the Gaon’s body in the 1950s, did so with rabbinical endorsement and guidance. Yet, they all died untimely deaths. Although the original move to the new cemetery was done to prevent desecration of the Gaon’s grave, all five men who participated in moving the Gaon’s body died within a year of the exhumation. I’d recommend extreme caution before carrying out such a plan. Crazy. Not much if anything is left to move. The irreligious anti-Torah government of the Israeli State has no standing on what to do with the kever of the Vilna Gaon. Ridiculous. Much more sensible for all of us Jews to leave Israel and move to Vilna. Even better, move the Gaon to Uman and build the 3rd Bayis there. In Lithuania the only good Jew is a dead Jew, and even that is no good if it disrupts a good soccer game. I wonder if a boycott of Jewish travel to vilna would help solve that issue.. This is a myth. I heard that from a very reliable source who was in contact with one of the persons involved in the exhumation long afterwards. When the same idea of moving the remains of Rav Nachman was raised with Bibi, the Breslov went Berserk (as in crazy, not the small town by that name in Belarus). They insisted that it would cause substantial social unrest and threaten shalom bayis if the Nachmanites had to stay home with their families on Rosh Hashanah rather than running off to Uman. Apparently, misnagdim are not nearly the partying types as the Breslov and would be happier to just take an Uber to a local cemetery in Yerushalayim. The request was denied, he said, because because the Lithuanian government wants to keep getting plenty green paper [dollar bills] from Jewish visitors. Plain & simple:- Nothing more sophisticated nor profound nor spiritual. Exact same reason goes for Ukrainian government vis a vis Rav Nachman. Kvetcher– a brother of one of the five told this to me many decades ago. american_yerushalmi – my Uncle, who lived in Vilna and who helped build the new ohel, moved to Eretz Yisroel in the sixties. He told me that he was conversing by letters (after he had been in EY) with one of his old friends who had transferred the Gaon’s body. Even if the buba meisa on the “curse of the Gaon’s grave movers” was true, which it is not according to multiple sources, that has nothing to do with the issue of enriching anti-Semitic Eastern European governments year after year while the kevorim of so many gadolim and tzadikim are within an hour drive from most frum neighborhoods in NYC or Yerushalayim. Kvetcher: nu, a machlokes acharonim. I think we’d all agree that le’chol ha’deios, messing with the Gaon’s grave is probably not a smart idea. In answer to “laughing” The Gaon’s body was actually as fresh as the day he was niftar when they exhumed him. I heard that there were those amongst the ones who were involved in the burial who gazed at his face, they were niftar within the year. From all my research in Vilnius, and before and after that about the Vilna, I have proof that the claim he was a Zionist is false. I can explain how I know this but not within the confines of this comments section. He also absolutely would have agreed that only Moshiach could decide about the management of the Temple Mount. The idea that the Dome and or Al Aqsa could be demolished BEFORE Moshiach’s arrival to build a “Third Temple” would have been anathema to him. Anyway, as I have been counselling since 2001, the correct philosophical position for the Holy Land/State of Israel/Palestine is best encapsulated by the Johnny Mercer Maxim. Thus the extreme ant-Zionist position and the extreme uber-Zionist positions are incorrect. The BDS movement is also wrong because the right, redemptive, healing economic, political and civil structure in the Holy Land Commonwealth/Confederation involves co-operation on many levels. whatever it is, mechalilei shabbos should not be the ones coming up with such brainstorms,or have any say on the matter. digging up the grave a malach elokim should lie solely in the hands of the gedolei hador. thats how i know its wrong, judging by whos idea it was, its sure to be מזוייף מתוכו. Yellow_Esrog – The same Uncle who told me about the “myth” of everyone dying also told me that the other story was untrue. It’s not meant to be disrespectful, but these stories are at best unproven.